After doing arrangements for a group that appeared on a previous season of NBC’s hit show The Sing-Off (more details about my work available here), this season I’ve come on board to write and record a large quantity of a cappella underscores that join the seams of this wonderful show. The Sing-Off features sixteen of the country’s best a cappella groups performing popular songs like you’ve never heard them before. There’s no lip-syncing, backup bands, or safety net. It’s hosted by multi-platinum recording artist Nick Lachey and judged by Ben Folds (Ben Folds Five), Shawn Stockman (Boyz II Men) and Sara Bareilles. Composer Michael Elsner and I came together to compose and record more than sixty different cues, ranging from short vocal stabs to grooves in various styles that will be used throughout the season. We began by working on basic demos that outlined our ideas. Decisions about tempo and feel were made first. Then we laid down layered rhythm tracks of claps, snaps, chest thumps, foot stomps, and mouth percussion. Melody and harmony ideas came next, then background filler parts to accompany the melody and harmony. After our skeletal demos were complete, we brought in a team of nine session singers to bring the music to life. 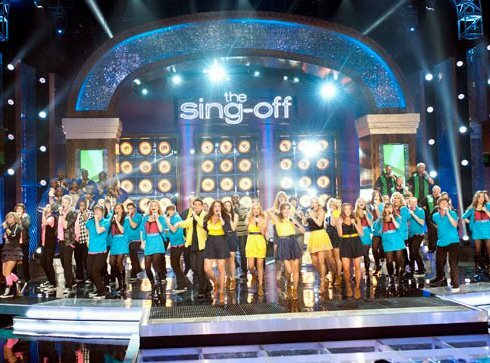 The same music is also being used for new international spin-offs of The Sing-Off that will be appearing in the next year overseas.